BOULDER GREEN STREETS LAUNCHES IT’S CAR-FREE ‘100 DAYS OF SUMMER’ CAMPAIGN ON JUNE 6th. 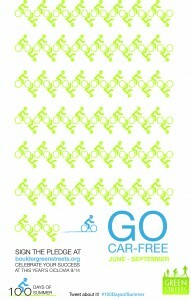 This summer, Boulder Green Streets will be launching its first ever car‐free summer campaign. Dubbed “(100) Days of Summer”, the campaign begins in June and culminates at the annual Ciclovia event on Sunday, September 14th, 2014. Participants will be encouraged to give up their car for the summer in favor of more environmentally friendly modes of transportation, such as biking, walking, and busing. 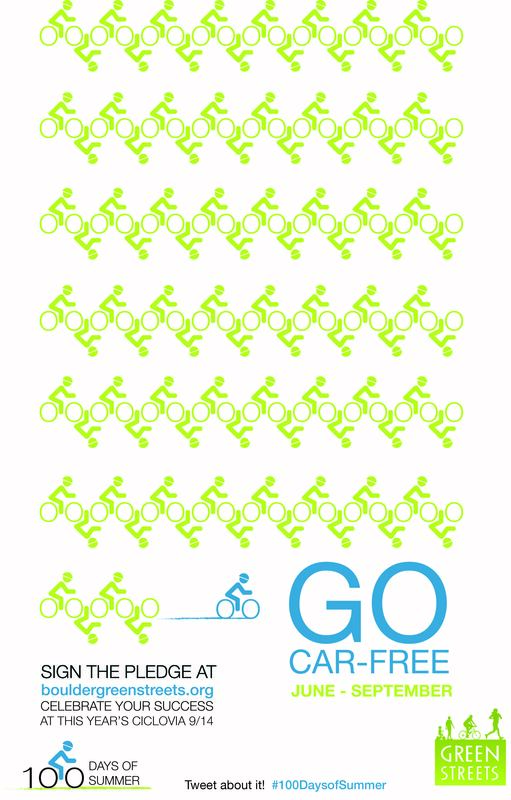 Throughout the month of June (Bike & Walk Month), participants may sign the car‐free pledge on Boulder Green Street’s website and can opt to receive a daily tip on going car-free via email. These tips will also be posted to social media. At the Ciclovia, and the final day of the campaign, pledgers will be entered to win various prizes aligned with Boulder Green Street’s health and sustainability mission. The Ciclovia will not only be a chance to learn more about this mission in an interactive way, but will also be a celebration of the efforts made daily by the pledgers and other citizens. The goal of the campaign is to let people realize their unnecessary reliance on automobiles, especially as the City of Boulder continues to develop the Transportation Master Plan. Boulder strives to be an extremely bike and pedestrian‐friendly city, and Boulder Green Streets works to encourage citizens to participate in creating an even greater car-free community. Please print and share this poster with your social networks!